Suit Master in Patong Thailand easily made our top 5 custom clothing stores. That is the top five from the ten that we tested based off reading several hundred reviews on Google and Trip Advisor for the best custom suit makers in Patong Phuket, Thailand. I’d recommend the shop to anyone in need of a custom suit, especially for higher end fabric choices and for the larger gentleman / irregularly shaped man like myself, who they nailed the fit for. Although Suit Master is located a bit off the main drags of Patong, you’ll never be too far away from the shop or any other establishment when staying in Patong Beach as the main town is quite small. Suit Master is about a 10 – 15 min walk form Bangla Road at a leisurely pace. Upon entering the shop, you’ll first walk past some well-dress mannequins and then onto the good stuff of bolts and bolts of fabrics. They also had a nice accessories case with collar stays, bow ties, ties and cufflinks. We were lucky enough to be in the shop when Peter, the owner, was there. Peter and I hit it if off immediately as we both share a love of fine fabrics and watches! It was not long until we got down to business looking at the “Suit Master” difference in construction and other characteristics that set Suit Master apart from the cheaper makers in the city. Peter’s passion and pride in his work was infectious, as we really got down to the fine details of quality suit construction. I went in with the intention of having a tuxedo made, but knew I’d end up ordering more. Trevor [my photographer for the day] also bought some custom shirts on our visit. I was greatly impressed by the construction quality, attention to detail and overall salesmanship of Peter and his garments. It was very much like the higher end fitting experiences I’ve had in the USA and UK, with respect to custom options when making final design decisions. After much deliberation, we opted for the below fabrics to make a tuxedo for an event I had coming up in Hong Kong. The jacket would be made of a dark gray plaid, with traditional elements such as the satin peak lapels and fabric buttons. As for the trousers, I also went with traditional black accompanied by a satin strip down the out-seam of each leg. I didn’t want to go too crazy, as a tuxedo is meant to be formal after-all and this was already going to be a little fun. A word to the wise, you want to avoid going from fun to foolish and take into account the variation in your own wardrobe and events you shall be attending. First learn the “rules” [which I still am] in order to break them a little! Just because it’s on the red carpet, does not mean it will be appropriate for your wedding day. Just one and a half days later the jacket and shirt were ready for an initial fitting. As is almost always the case for me, there were some issues around the sleeve holes, and resulting chest piece fabric. By having this initial fitting the tailor could see, and thus alter the garment to accommodate for my unique physic. As stated many times before, the value for money with this level of service is unrivaled from anything I’ve ever experienced. But as with all the tailoring houses we went to, it’s good to know a little about how you want a suit to fit you well for you and your own body type / tastes. My travel companion Trevor [this site’s Travel Editor] also had the aforementioned custom dress shirt fitted. After selecting the fabric on day one, all that was needed was one first fitting with a few tweaks and he was all done! The shirt fit his slender but athletic frame perfectly. Quite the body type difference from myself, showcasing the tailor’s skills in fitting a wide variety of gentlemen. Getting back to my tuxedo fitting, another day had passed and the jacket [this time with sleeves on] was ready to try on. It was extremely close, and I was amazed at how they had nailed the chest piece [fabric from the arm hole to lapel] as I have forward sloping shoulders and standard suit patterns usually result in an excess of fabric being there which causes unsightly ripples. I felt very comfortable with how the suit was looking and feeling. Just another day and a half later all the garments were ready for collecting. I was very happy with the overall fit, and quality of the garments. It’s also worth noting that Suit Master provided the best suit bag and hanger from any of the 10 tailoring shops we tried. 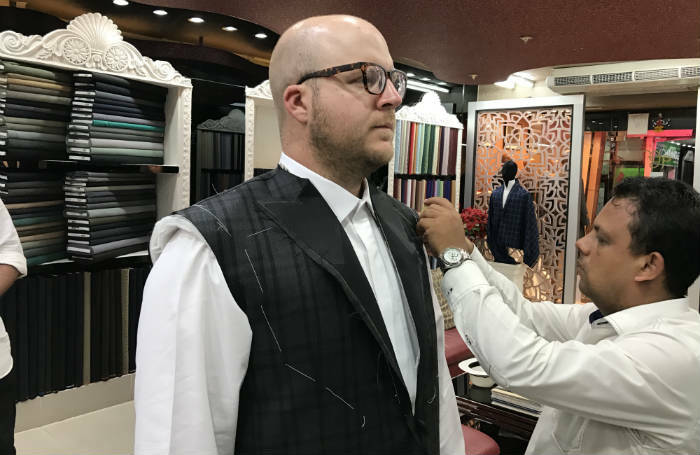 If you’re used to getting custom suits made in the USA or Europe then Suit Master is going to be one of the best options if not the best in Patong. 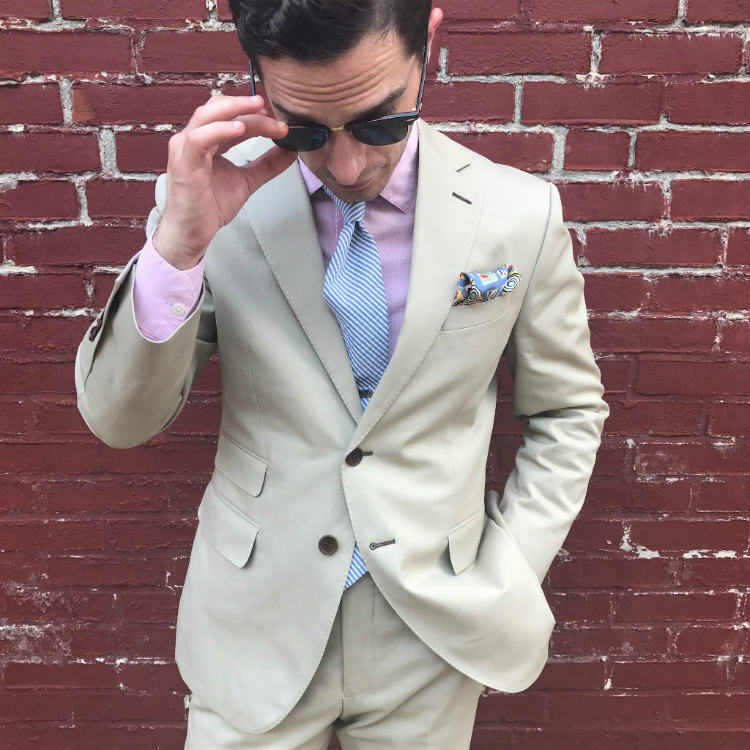 They have the highest quality fabrics I saw, and the most design option from all of the shops that made our Top 5 Patong Custom Suit Tailors list. The only regret I have was not making the jacket a little tighter, especially at the mid of my back to show a little more “shape”, but that was on my end to not give the feedback / desired fit. Again, highlighting the importance of knowing how a jacket should fit for your body type and eye on what looks best on you. Peter, the owner, also makes several trip to London and the North Eastern USA corridor several times a year. You can find his schedule below via the link to his website. Time & Number Of Fittings: two fittings, and total time from initial visit for final garments was five days [but could have been as little as four as we went on a day trip out of Patong]. Service / People: Service was great, and Peter the owner really knows his suits. Options Both Fabric & Design Points: By far the best quality fabric selection, and deepest design options. Cost: Right in line with the other high quality shops, a decent two piece suit will cost between $300 – 500 and up depending on the fabric and finish quality. Quality Of Finished Garment: Very high and inline with what I’ve bought “custom made” from USA and UK retailers [who for the most part outsource to Asia, thus the direct-to-consumer savings when visiting Asia yourself]. Total / Value For Money: Overall fantastic value for money! When back in Patong, or when Peter visits the USA again in the near future, I’ll be purchasing some additional suits and shirts for sure! Reviewed by Paul Anthony on March 25, 2017 . "Suit Master is easily one of the best tailor houses in Patong Phuket! Peter's attention to detail and knowledge of garments really sets his shop apart from many of the other custom suit makers in Patong. I will be definitely be ordering more garments from Suit Master in the future." 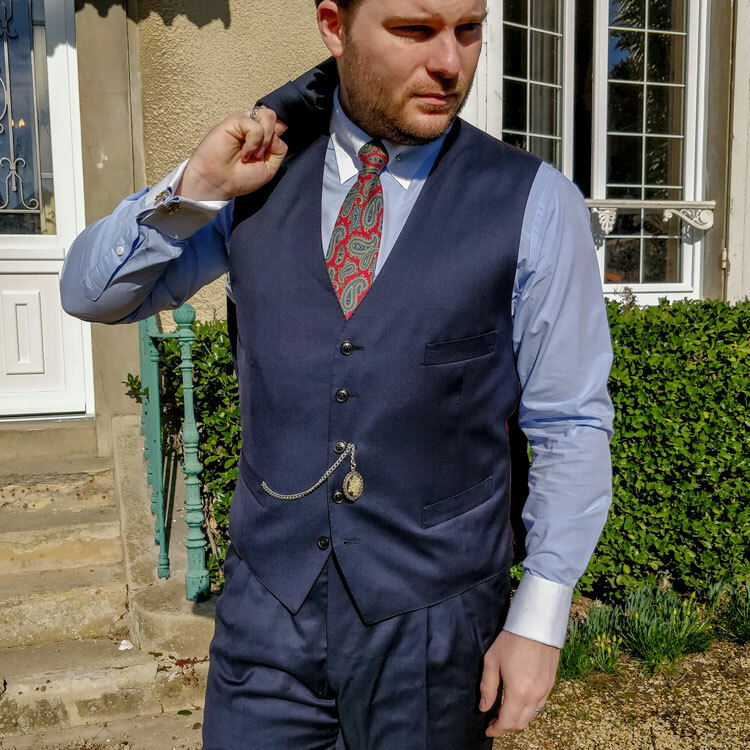 I purchased 2 suits from Peter and his team based on Paul’s review, I couldn’t be happier with the professional service and high quality of the suits. I recently met up with Peter in NYC during one of his trunk shows and get a few more pieces myself. Delighted to hear about your positive experience! Paul, thank you in advance for your work on this review and the other reviews for tailors in Patong, Phuket. Do you have recommendations for Phuket City as my wife and I are staying on Koh Yao Yai Island on the east side of Phuket? Do you have a arm’s-length or a direct financial relationship the tailors in Phuket? I regret the hard questions, but transparency is difficult to discern with reviewers. Thank you for your kind words, and apologies for the delay as I’ve been travelling. To be honest I’m not sure of any tailors outside of the main core of Phuket. I was only there for 10 days, and had a few day trips. Further I paid for all the garments reviewed (both Trevor and I), so budget and time constraints were at play. Since the reviews the only tailor I’ve kept in contact with is Peter from Suit Master, as he nailed my fit (funny enough I wore the tuxedo just last night to an event), and got several garments made since. Further, he also offers a full canvas option (that is made in Bangkok, and shipped to your respective home country). Lastly, I also liked his wide array of quality fabric / mill options. But obviously for both of those latter options you pay more. To be honest I liked them all! All were great people, but Peter and I clicked and I’m a fabric junkie so he pips the post for me personally. I have not been paid for these review or been given any garments, however Peter has been kind enough to give me a slight trade discount on subsequent purchases for full disclosure. What a great experience. This is my first time having a bespoke suit. Actually two suits and six shirts. And my wife got three dresses. We just got them delivered and tried each garment; they fit perfectly! But most importantly, I learned more about fabrics, wool blend quality and tested by burning small swatches of the cloth. The back room is where the real magic happens. Education, quality material, quality team. It was like going into a fine wine cellar. I’m coming back for more. Paul, thank you for your review and the introduction to Peter. Delighted to hear about your experience and that it was so enlightening. Thanks for sharing and we particularly appreciate the insight into the educational side of your time at Suit Master. I met Peter in April of 2017 in Phuket upon Paul’s recommendation. This has been one of the best points of all my travels to Phuket. Peter is a premier professional, his eye for fashion forwardness is distinct, his options reflect a modern, yet classic intelligence, and his quality and workmanship are a constant level of high end expertise. I’ve now ordered four separate times from Peter, and I look forward to seeing him again and getting more tailored clothing. Forget anything that you see as far as rankings on Trip Advisor and such…this site which reflect’s Paul’s sincere and forthcoming attitude and distinct taste for style is the best place to go. Visit Peter at Suit Master…it will be quite worth your time. It has been for me every time. Thanks for your well-written comment that confirms Paul’s thoughts in this article. It’s much appreciated to have a second opinion! There really is no reason to go to any other tailor in Phuket (I shopped others, just to make sure). Peter and his family business, Suit Masters, are the cream of the crop. 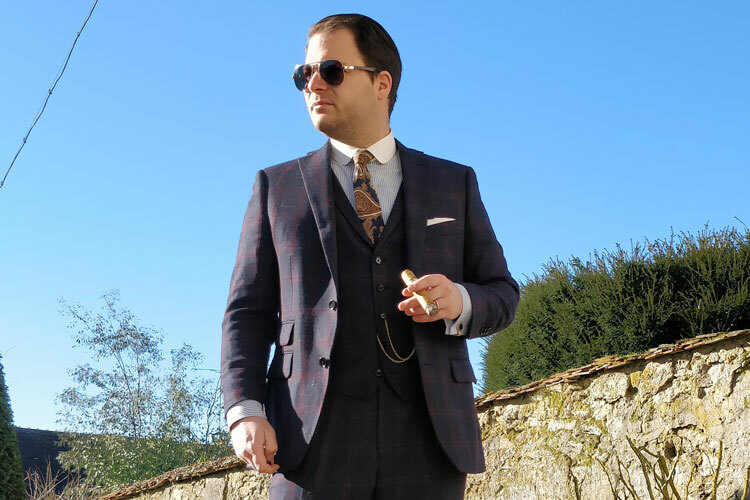 Peter has relationships with world renowned Italian and English mills and as a result, can make you a suit from the best fabric you can get a suit made from! I bought two suits from him, and even though I’m in the US, I see no reason why he won’t be my tailor for as long as I’m buying custom fit clothes. He’s knowledgeable, he’s passionate about his business, and Suit Masters is so far ahead of anyone else! Highly recommended! Thanks for your comment and great to hear that your experience has been so positive! Nothing better than a testimonial from personal experience. Had 2 suits, a 3rd sports jacket and 5 shirts made with Peter and his team at Suitmaster. Service and end result were superb. Much better fitting than 2 previous similarly priced tailors I have used in the past. Delighted to hear that your experience was so positive! Always great to hear about Suit Master’s happy clients. Thanks for the excellent review of Suit Master. I took your brilliant recommendation and was very satisfied with my experience with Suit Master. I got a suit, ten shirts, and an extra blazer. I even recommended Suit Master to my friends when Peter came to Singapore. They were very satisfied also. As a whole, there is great dedication on behalf of the owner, Peter, and his team, and this can be seen in the attention to detail and ensuring the best possible fit for the customer. Delighted to hear that your experience with Peter was so positive! We’re very fond of his work and we continue to call upon him for his services. We’re hearing nothing but great things and it’s fantastic his growing community of clients! Thanks to your article I decided to pay Peter a visit and I couldn’t have been more impressed! I ended up ordering several suits and shirts from him and they are all wonderful. The fit is perfect, the quality of the materials is superior, and the craftsmanship was excellent. I too am a bit larger of a man and Peter (as well as his staff) worked diligently to make sure that my suits fit comfortably and looked stunning. I get compliments all the time on the suits that Peter made for me. I will be ordering from Peter again in the near future and I do want to point out that Peter makes several trips to the US every year so that he can update his clients measurements. This is a huge benefit for me because I am diligently trying to lose some weight and I trust Peter’s ability much more than my local alteration shop to make sure my suits fit perfectly. I can’t recommend Peter enough, he truly is the Suit Master!! Thank you so much for writing this article and turning me on to Peter and his staff! Really appreciate you sharing your thoughts and experience with Peter. It’s certainly great to hear and it will undoubtedly help other people that will come and visit this article! Very impressed. Visited Thailand in January 2019 and had a suit and three shirts made for myself, and three dresses for my wife and daughter. All tailored beautifully with quality fabric. So pleased I ordered another six shirts to be sent back to NZ for me. These arrived in just one week! Great quality, and expertly tailored. Highly recommend visiting this lovely Tailor in Patong. Thanks Peter!! Delighted to hear about your positive experience! Thanks for sharing it with us! 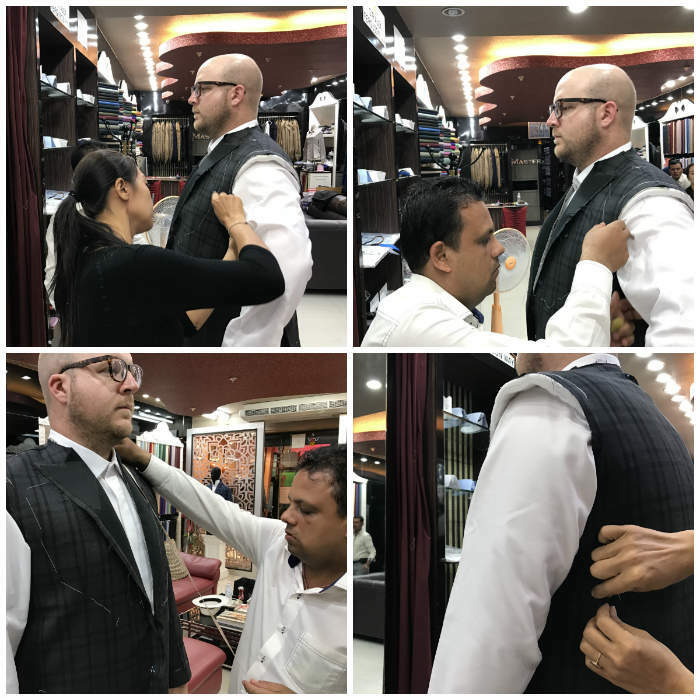 Top 5 Best Custom Suit Tailors In Patong, Phuket Thailand – Tried, Tested & Reviewed!